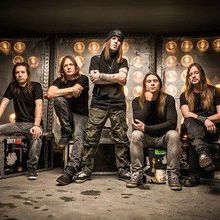 Children of Bodom with Death Angel, TYRwith: Death Angel, TYRWhat started out as a youngsters’ combo in 1993 struck the worldwide music scene in 1997 with a debut that truly lived up to its name – Something Wild. 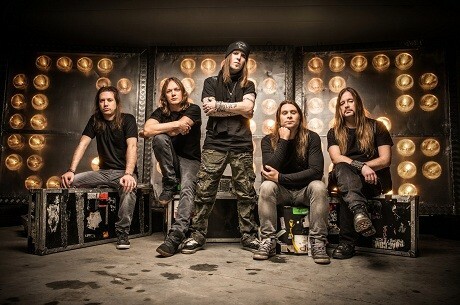 From then on, the evolution of Finnish five-piece CHILDREN OF BODOM has grown into one huge success story, unmatched by any other up-and-coming Scandinavian metal export to date. Followed up by 1999’s Hatebreeder and the Millennium release Follow The Reaper, COB’s first three albums on Nuclear Blast Records set new standards in the field of brutal and fast but yet highly melodic heavy music, especially impressing with front man Alexi Laiho’s incredible versatility and jaw-dropping skills, who’s been elected “best metal guitarist” by the readers of renowned Guitar World magazine in the past, among countless other decorations. Four more smash records – namely Hate Crew Deathroll (2003), Are You Dead Yet? (2005), Blooddrunk (2008) and Relentless Reckless Forever (2011) – gradually let more modern influences flow into the Finn’s style, without ever neglecting their trademark mixture of rough vocals, shredding riff attacks and catchy keys. A formula for success that led to consecutive #1 chart entries in Finland for their last four records as well as gold status for their entire discography, apart from Follow The Reaper that even achieved platinum (!) status! Moreover, CHILDREN OF BODOM have made the world’s biggest stages their second home over the years, playing the most important festivals such as the Wacken:Open:Air, Hellfest, Graspop, Loud Park Festival and Bloodstock on a regular basis and attaining a tremendous following all around the globe.2013 sees the Hatecrew returning home to Nuclear Blast with the 8th studio album of their career. Recorded and produced by the band in their in-house studio in Helsinki as well as in Petrax Studio, Hollola, with support from Peter Tägtgren (HYPOCRISY, PAIN), Halo Of Blood distinctly seizes on the early works’ sense of melody and coarseness, while putting it all into a modern-day soundscape and venturing quite a few new steps, such as presenting both the band’s fastest and slowest song ever. Mastermind Alexi Laiho states: “Believe it or not, but we’ve managed to keep it fresh and new while still maintaining the elements that make COB’s sound recognizable. Lyric-wise, Halo Of Blood comprises topics we’ve never dealt with before.” Rounded off by a classic COB cover artwork created by Sami Saramäki, Halo Of Blood bares the band’s roots and lets them sprout into 10 timeless anthems of sheer magnificence. As Laiho promises: “Whether you enjoy it with a beer or a glass of water, I’m sure you’ll have a blast!” Obey the reaper!